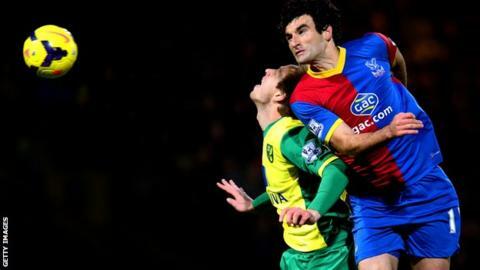 Crystal Palace captain Mile Jedinak has signed a new three-and-a-half-year contract with the Premier League club. The 29-year-old Australia international signed a three-year deal when he joined as a free agent in 2011. Jedinak has played nearly 100 times for the Selhurst Park outfit, and was an integral part of the side during last season's promotion-winning campaign. The midfielder became the Eagles' captain last season and was recently named Australia's player of the year. "The first season was great and the second obviously ended in us getting promoted and now we're in the Premier League where we want to be," said the Sydney-born player, who had previously played for Turkish side Genclerbirligi before joining Palace. "I'm really happy here and pleased that I've done this." Palace have won just twice this season and are currently at the foot of the Premier League table. Their 1-0 defeat at Norwich on Saturday was their first outing since Tony Pulis took over as manager.